this post is for my new pals over at dare to dream - we had fun chatting online tonight and we all brought in the new year together...well, for the east coast anyway. above is a board book i did this past summer, using my favorite quote by picasso, "art washes away from the soul the dust of everyday life." this quote really sums up my whole 2009! so i offered up this dare to everyone who was on the new year's eve chat: use your favorite quote or excerpt from a poem in a scrapbook layout, a card, an atc, or any other type of art or craft. post a pic of your piece on your own page at dare to dream by midnight 1/3/10, then leave a comment here to let me know it's posted. i will draw a winner at random from all entries posted. the prize is a blank canvas book and a jar of liquitex acrylic paint! i hope whatever quote you choose inspires you for the new year! 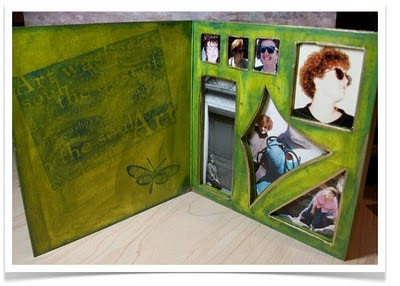 thanks so much to my friend debby lewis, who has quite a fun crafty network going on over there - check it out! this is a blank board shadow box that i collaged and painted, then stashed xmas goodies inside for my mother. first i spritzed it inside and out with a combination of burgundy and gold spraywash paints. 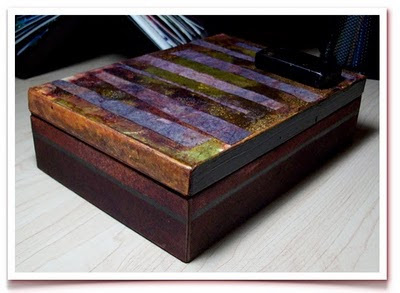 once it was dry, i collaged the lid with 3 colors of torn mulberry tissue and painted strips of lutradur, sealed with matte gel medium. i love how the mulberry tissue colors just melt and blend together with the medium. i added a domino i painted with alcohol inks to the lid as an embellishment, and lined the sides with a black paint marker. inside i added bits of mandala transfers. i started this little 13"x20" quilt on a tuesday night while hanging out with my "twisted thimble" quilting group. i pulled some fabric scraps from our community swap pile and just started snipping out flowers and shapes as we chatted. 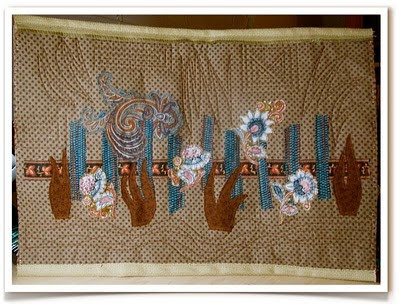 i eventually saw a fenceline with flowers and shrubs emerge from the fabric pieces. i pinned it all down the way i liked on some polka dot fabric, brought it home, and there it sat for a few months. 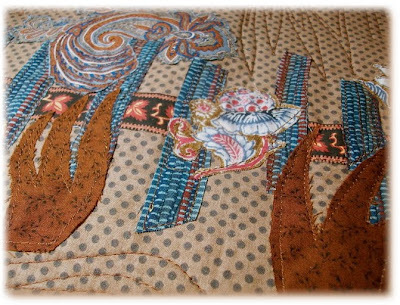 then a few weeks ago i machine-stitched all the pieces in place, like raw-edge appliqué. finally today i finished it - yay! i used a piece of upholstery fabric on the back, and flipped the nicely fringed selvage edge over to bind the top edge. i trimmed the other edge of the backer fabric with my wavy-edged rotary cutter and flipped it to the front to bind the bottom edge. i stayed loose with the machine quilting...the streaks and squares on the top remind me of farmhouses and grasses in the distance. the freeform wavy lines at the bottom look like the ground beneath my little fence. i opted not to bind the sides...i like how leaving it "frameless" makes the fenceline seem like it might keep on going. i just did a zigzag stitch along the sides. plus i'm all about making shortcuts look like intentional design! just freshening up the blog a bit for the new year. here is my very shy sock bunny that i made in craft camp at work. he is shy because from the front, he looks like a penguin. 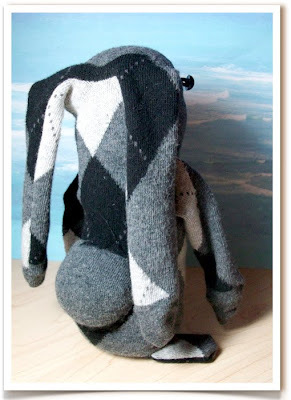 somehow i managed to morph two different species together with this argyle sock! this project comes from a super cute new book coming out from c&t in the spring - socks appeal. it's that time again....the 4th annual "one world, one heart" blog tour starts on january 25! i participated with over 900 other bloggers last year...this tour is a terrific way to meet other bloggers from around the world, find new inspiration for just about any creative endeavor you can think of, and maybe even win a prize! An attempt at graffiti art...includes spray wash, acrylic, paint marker, and black sand texture gel medium. Spray wash, stenciling and stamping, with a veined gold leaf accent. Acrylic inks and paints, and stamping. Spray wash and acrylic paint, then accented with a gold leafing pen. i think what i like best about painting on blank canvas books is the joy of experimenting. it's a great surface to try lots of different techniques and mediums. sometimes i gesso it first, but usually i paint on the raw canvas. for this cover above, i used spray washes in browns and golds, then traced a mask of the hinges and keyhole with a micron pen. after it was dry, i slathered on some gloss gel medium and pressed a texture into it with a large rubber stamp. this one is colored with permapaque markers. i combined a circle template set with a square template set and was happy with how they overlapped. I drew the apple and the letters with permapaque markers, and the banana with copic markers. then i painted pouring medium on top to give the fruit a nice hard gloss. canvas books are great for making soft children's books! i used a copper spray wash for this background, with paper flowers masked out. my green chalk ink stamp pad was the perfect shape to easily press leaves, then i colored the flower centers with oil pastels. i just finished these covers for a set of painted 6" square blank board books to give to C&T sales reps to show art supply stores. i mixed acrylic paint with glazing medium for a glossy textured base coat, then layered on more paint, metallic spray ink and texture mediums. it was a great testament to the stability of the board book surface, and it was really fun to experiment with varying levels of opacity versus transparency, shine versus texture. i also loved the effects i got by applying paint with my fingers, and by thinning the paint with water to create drips. for both these canvas book covers, i gesso'ed them first, then used inktense watercolor pencils to draw my circles and shade them with a wet brush. on "rolling along," i added lines with a glue pen and silver embossing powder. on "awareness," i added white and tan embossing powder, plus a little accent of crackle medium on each circle. i wrote my words with paint markers. these will go to c&t's sales rep group that calls on art supply stores around the country, to use as models to help sell the canvas books. i'm making some projects for work; models to show off our art surfaces. this is a blank canvas book — the cover and one inside spread. i painted it with acrylic inks, acrylic paints, color washes and paint markers. the raw canvas allows for any type of painting, from crisp stamps and stencils to the blurry bleeds of inks and washes. i painted randomly, then chose a word that each image made me feel. now i need to knock out 6 more books! i try to never waste a lick of paint. any little bits leftover get dabbed on to blank atc stock that i always have at the ready. i end up with really cool backgrounds for future atc's this way. i often use little round sponge dabbers which hold a lot of paint...i can usually paint a whole background with just the extra that has soaked into the sponge. i get these cool circles when i press the dabber down firmly. btw, the face inchies in the "laugh" atc is courtesy of my crafty pal, lisa m.
i just got my first ranger order in, so i gave myself a challenge...create a card using a bit of each product! made with resist ink, utee, grungeboard, distress crackle paint, glossy accents, crackle accents, 7 different alcohol ink colors, filmstrip ribbon, washers, hitch fasteners, hinge clip....phew!! Have fun making one yourself with my free project instructions! you can purchase any and all of this goodness from my website at 25% off retail...and i always include a free giftie with every order! on the second sunday of each month, i am hosting a cardmaking madness day...and today was the first! 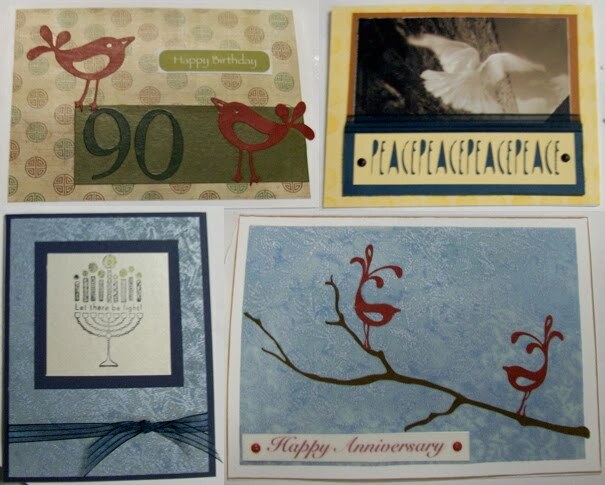 several friends came over and we had the die-cut machine humming, stamps inking, and paper trimming. and here is the aftermath - we got out all the toys!!! i was demo-ing alcohol inks on translucent paper and made a slate-color marbley background. 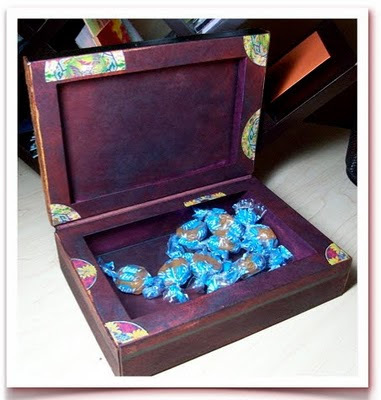 then after the ladies left, i checked out a new challenge blog that posts creative prompts. the current prompt is the word "core." the blog host listed several "core" things and phrases, including andromeda's core. i realized my slate background looked like the the night sky, so i added some different swirls and colors in the center to create my own take on "core." this was a fun collage experiment on a 12x12" piece of cardstock, combining stamping, spray masks, heat embossing, pouring medium and angelina fibers. the only boo-boo i made is fusing the angelina fibers to the paper after having already done some heat embossing. my iron smudged some of the images a bit. here's a close-up of the fibers fused on to the sheet with bo-nash 007 bonding powder. new digs for my blog! i changed the site address for this blog..."la femme papier" bids you all a sweet adieu. now my blog address is http:/lisalizalou.blogspot.com, which matches my website address. there were just three of us today, but we yacked and painted and had some nice quality time! here are a few of the fruits of our watercoloring labor...regena blended yellow, orange and violet into a cool streaky background. connie stamped a delicate pastel butterfly card, after allowing the water to make drips and patterns. my atc took on a psychedelic twist as i played with swirls of color. 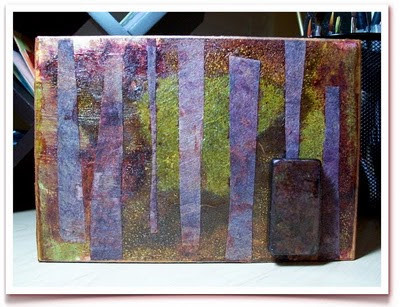 this saturday is atc club; we'll be working with watercolor - regular and shimmer. above are three different backgrounds i painted, and below is how i finished them off with some stamping and embellishing. 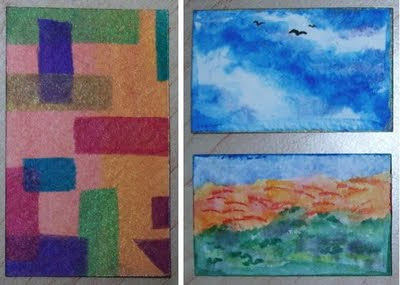 i also painted some mini-atc's (1.5x2.5) with no extra embellishing - birds flying in a cloudy sky, a tri-color landscape and a geometric pattern. these will make nice panels on greeting cards. i used luminarte and lefranc & bourgeois brands - they're both wonderful watercolors! and strathmore makes watercolor paper in packets of atc size, very handy! i sent out my first e-newsletter this week - yay! i hope all you subscribers enjoy it. i issued a challenge to anyone who'd like to join in the fun - it's a blind collaboration. i will collect virtual feathers from everyone, join them together into a beautiful peacock, and post the image for everyone. this is one i drew with aqua promarkers. 1. create a feather in whatever colors, style, medium you want. paint, draw, collage, stamp, sew, sculpt...and it can be any kind of feather, not just a peacock's. 2. take a good, clear picture of your work, against a white background. it's really cool to see everyone's creations, and it's rather liberating to make something without any rules, without knowing exactly how it will all come together with everyone else's. i also drew two prize winners from the first 100 subscribers...they were cindy derosier and jessica germain...both happen to be fiskateers by the way! those ladies are some lucky duckies! i put together a lovely prize package for each of them that includes a blank canvas book, some papers, embellies, fabri-tac, and liquitex acrylic inks. next week i'm starting a new free weekly e-newsletter called "a little art, a little craft..." that will be full of terrific stuff...new project ideas, profiles of cool artists and crafters, how-to tutorials, special offers, contest, challenges...it's gonna be fun! the first 50 to sign up for my newsletter (over there on the right) get their names in a fabulous prize drawing - a blank canvas book, some liquitex ink, and some assorted embellishments - you're gonna love it!